As in many states across the country, in Colorado and Nevada the demand for funding to maintain and improve roadways outstrips revenue dedicated for this purpose. At a legislative hearing in December 2016, the Colorado Department of Transportation (CDOT) said it needed $1 billion per year in additional funding for the maintenance and expansion of the state’s roadways. In Nevada, the state highway fund already runs significant deficits, which are expected to increase to nearly $300 million per year by 2025. 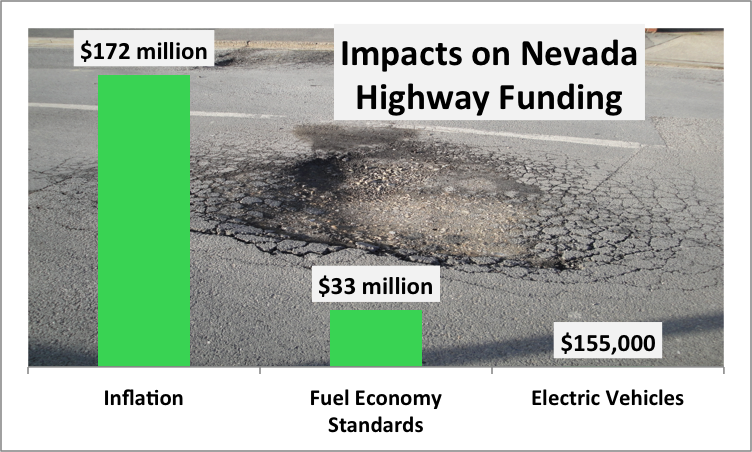 Both CDOT and the Nevada Department of Transportation (NDOT) blamed the inability of gasoline taxes (a major component of road funding) to keep up with funding needs partly on more efficient vehicles, inflation and electric vehicles. Unfortunately, this information is misleading. All three factors do mean less gas tax money for the states, but the scales are vastly different. Inflation has greatly hurt transportation revenue, while fuel efficiency has had a much smaller effect, and electric vehicles have had virtually no impact at all on transportation funds. For 25 years, the gas tax in both states has not been raised, staying at $0.24 per gallon in Nevada and $0.22 per gallon in Colorado. For perspective, the last time either state raised their main transportation funding source was back when Johnny Carson hosted The Tonight Show and cell phones were the size and weight of bricks. But one thing remained constant: inflation. Sometimes slowly and sometimes shockingly, prices for almost everything rose relentlessly in the past quarter of a century. For example, in 1992, the average Denver area apartment cost about $410 a month but today the average metro Denver apartment rents for about $1,200 per month. Housing costs, of course, affect the wages earned by construction crews, but prices also climbed for materials needed for road- and bridge-building. By its own calculations, the Colorado Department of Transportation estimates that what bought $1 in road-building in 1992 would have, by 2011, barely have gotten $0.40 worth. And of course, prices have risen in the years since CDOT’s study. These facts mean CDOT and NDOT have to purchase construction materials and pay workers based on the current value of money, while gas taxes have stayed stuck in the past century -- literally. Just to keep pace with inflation and have the same purchasing power as it did in 1993, the gasoline tax in 2015 would need to be $0.36 per gallon in Colorado and $0.39 per gallon in Nevada. If the states taxed at this inflation-adjusted rate instead of at the 1993 level, Colorado would have had an additional $313 million in gas tax revenue in 2015 and Nevada an additional $172 million. While current federal fuel efficiency requirements are ramping up significantly, for many years federal requirements remained essentially flat. Because of this, the average fuel economy of cars and light trucks increased only modestly from 19 mpg in 1993 to 21.3 mpg in 2015. If fuel efficiency had remained the same between 1993 and 2015, the estimated gasoline tax revenue would have increased only by $59 million in Colorado and $33 million in Nevada. These numbers show that to date, better vehicle fuel efficiency has had a relatively minor impact. In 2012, electric vehicles (EVs) began entering the marketplace. While their sales are rising, the numbers remain relatively small, with about 1 electric vehicle for every 1,000 vehicles on the road. In Colorado, EVs already pay an additional registration fee of $30 per year that goes into the state’s highway fund. If each state had set the EV fee at $85 per year per vehicle (about what the average new gasoline-powered vehicle would pay in annual state gas tax), the fee would have generated an additional $296,000 in Colorado and an additional $155,000 in Nevada in 2015. So, even if Colorado and Nevada had implemented the hypothetical higher EV fees, each state’s highway fund would have raised revenue by less than one tenth of one percent. And both states still would face funding shortfalls for the billions of dollars they need to upgrade their transportation systems. These numbers clearly show that electric vehicles have not substantially harmed state road funds, while increased vehicle fuel efficiency has had a minor effect. Inflation is the main reason why gasoline tax revenue is no longer sufficient to fund roadways. In the future, increased fuel efficiency and larger numbers of electric vehicles might affect transportation revenue – with good policies at both the federal and state level, fuel efficiency should nearly double and the number of electric vehicles on the roads will rise enormously in the next 15 years. In the next decade or so, states may need to phase-in funding mechanisms to assure that all vehicles pay appropriate shares of road maintenance costs. But taxing electric vehicles will do nothing to solve today’s funding problems. States can promote additional electric vehicle adoption with no worry that doing so will hurt transportation revenues over the next few years. Mike Salisbury is the Senior Transportation Associate in the Transportation Program at SWEEP. The transportation program focuses on strategies to improve the fuel efficiency of the vehicle fleet and to reduce motor vehicle use. Mike holds a Masters' degree from the University of Delaware's Center for Energy and Environmental Policy, where his research focused on transportation systems and renewable energy.